It’s been a while since I last posted a cake recipe on the blog. At the beginning of the year, I committed to sharing a new cake, each month. Though, as is the usual manner of things, my attention was stolen and held captive to something, someone, else. Side-tracked is an understatement, but, I like to think that I made up for it by sharing other sweet things that have been in frequent rotation. Cookies for one, as my instagram will attest. 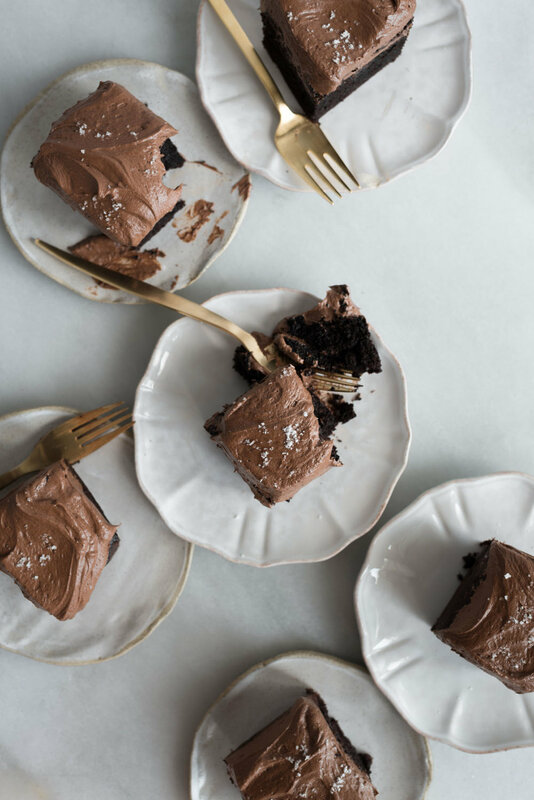 This Chocolate Sheet Cake with Fleur de Sel Frosting, is a way of demonstrating my commitment to the cake a month project. It’s a good chocolate cake, my best, if you will. An everyday kind of cake, that combines minimal effort with maximum flavour reward. It’s my favourite party cake, and the one I usually make for a crowd. I haven’t been into celebrating much lately. Not for lack of reason. And even though I’m burying, I standby the notion that a slice of this cake, is celebration enough. 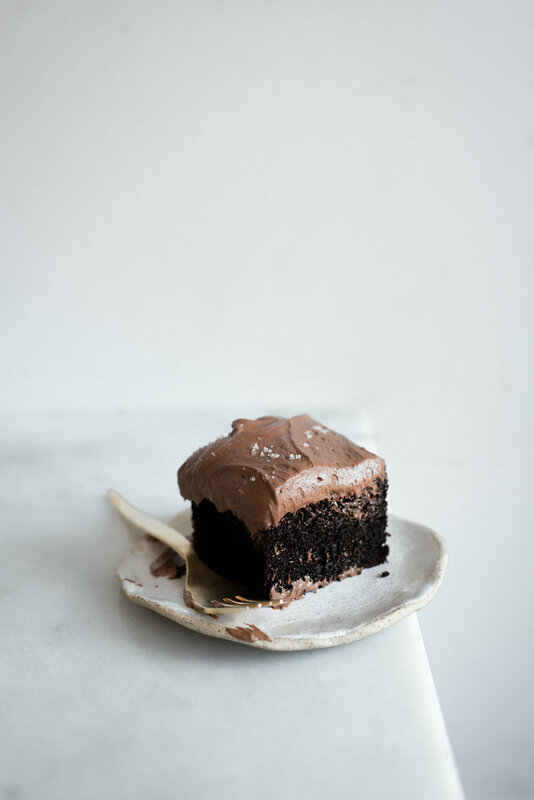 Chocolate Sheet Cake with Fleur de Sel Frosting is my ideal. It’s a no-brainer kind of cake, made with few, staple, ingredients. There’s been a lot of highlight upon the humble sheet cake recently. And for good reason. They’re delicious. Here, the chocolate cake is moist and rich with deep, dark chocolate. There’s a subtle hint of bitterness from the presence of coffee too, which only adds to the overall intensity. The cake is thickly smothered in a hybrid frosting that combines the aeration of mousse and richness from classic buttercream. I’ve always believed that the ratio of cake to frosting should be an equal 1:1, and this, only serves to prove the point. The cake itself, is just as good as the frosting, and, when combined together, it’s heaven. There’s a pinch of fleur de sel over the top too, which renders the most perfect mouthful. You could decorate the cake with whatever you desire. Fresh raspberries, are always a hit, as are sprinkles. I can never go past a classic chocolate sheet cake with sprinkles. I decorated a cake like this in chocolate chips once too, but then again, things were getting sweetly desperate. Regardless of how it’s dressed up, it's always delicious. The brilliance of this recipe lies within the quality of ingredient. Cocoa powder should always be dutch processed, never natural or Bournville. The difference between the former and latter lies within the alkalization process. Dutch processed cocoa is treated with a solution that neutralises the presence of acidity, resulting in a dark, smooth and intense flavour like nothing else. Try to use the best dark chocolate block you can find for the frosting too. It’s a simple cake and there’s nowhere to hide. A variety of salts form the basis of my pantry, so I would recommend sourcing a few different types, to enhance your baked goods. Fleur de sel is an un-refined yet delicate salt that is primarily used for final seasoning. It’s readily becoming more available, though, depending on location, it can be difficult to source. A pinch of Maldon flaked salt does well for an equal alternative. Regular table salt should not be used as a substitution. Brewed coffee is added to the frosting, to enhance flavour and smoothness. As such, it’s important that the coffee is completely cool before it gets mixed in. If it’s too hot, it could potentially melt the butter and turn the frosting into a sloppy mess. So be wary of its temperature. It's a rather forgiving recipe though. I’ve tested the addition of boiling hot coffee when added to the frosting. It did slightly melt the butter, but, the frosting when beated for an extended period of time, was able to be brought back to how it originally should be. Pre-heat the oven to 180 c. grease and line a 32 x 22 cm rectangular baking tin. Let the parchment paper slightly overhang the sides. Place the instant coffee granules and boiling water into a measuring jug. Stir until the granules are dissolved. Set aside to cool, until needed. In a large mixing bowl, whisk together the flour, cocoa powder, baking soda, baking powder and salt, until evenly combined. Stir in the sugar. Pour the buttermilk, vegetable oil, eggs and vanilla bean extract into the mixing bowl with the dry ingredients. Whisk, until evenly combined and glossy. Pour in the brewed coffee and whisk until smooth. The batter should be very thin and runny. Pour the batter into the prepared baking tin. Bake, for 30 to 32 minutes, or until risen and a skewer inserted into the middle comes out with a few moist crumbs attached. Remove from the oven and let the cake cool in its tin for 15 minutes, before carefully turning it out and onto a wire rack, to cool completely before frosting. Again, place the instant coffee granules and boiling water into a measuring jug. Stir until the granules are dissolved. Set aside until completely cool. Next, place the finely chopped dark chocolate into a heatproof bowl set over a saucepan filled with a few centimeters of barely simmering water. Do not let the base of the bowl touch the water. Heat, stirring often, until the chocolate is completely melted and smooth. Remove the bowl from the heat and set it aside to cool. Meanwhile, in the bowl of a stand mixer fitted with the beater attachment, beat together the butter and sugar, on medium speed, until light and creamy, 3 to 5 minutes. Pause mixing to scrape down the bottom and sides of the bowl as needed. Pour in the melted and slightly cooled dark chocolate. Increase the mixer speed to medium-high and beat until well combined, 2 more minutes. Again, pause to scrape down the bottom and sides of the bowl to ensure thorough mixing. Add in the cocoa powder, cream, vanilla bean extract and salt. Beat until just combined then pour in the cooled coffee. Set the mixer speed to high and beat for a further 2 minutes, until very smooth and fluffy. When you’re ready to serve, set the cake out and onto a serving plate or cake stand. Using an offset spatula or the back of a metal spoon, generously spread the frosting into swoops and swirls over the top of the cake. Sprinkle over a little of the fleur de sel, before slicing and serving. The cake is best eaten on the day of making, but can be kept in an airtight container, stored at room temperature for a few days.